I decided that I needed to experience life outside of the camp more. I am expected to post a daily blog about life behind the scenes in Moremi and I was even beginning to bore myself, nevermind the audience. So I was up and ready at 3 am. Did some pilates until it was time to wake Brad and we tried to sneak out without waking Rio. Unsuccessfully. So Rio came with. My attempt to launch into the real work world kid-free was not entirely to be. I was at least getting out though. Putting aside my guilt at Keita waking up to find Frannette instead of me in the tent with her (which really is ridiculous because she loves the novelty of waking up to her Net instead of her already-grumpy-at-6am-cos-hasn’t-slept-all-night mum), we drove off into a spectacular sunrise. We drove around for about 3 hours trying to find the lions, which were tantalizingly close, judging by the amount of tracks around. Unfortunately with no luck, so we returned home by 11. 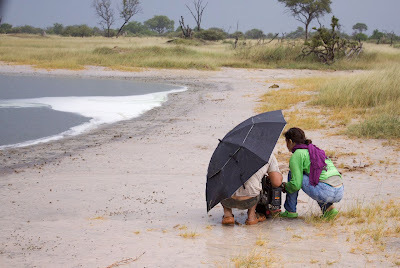 In the afternoon we planned to go to the hippo carcass that the crew had found a few days earlier. It is apparently a very large bull and the carcass is intact in that most of the bones are there. We stopped off for a swim en route and as soon as we had finished a heavy rain started. 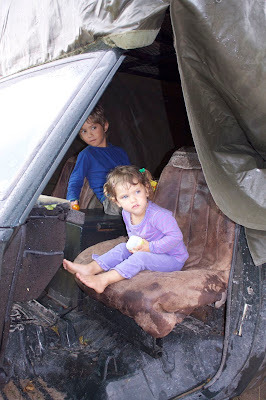 We covered up the car and huddled inside, having great fun with the novelty of it all. Brad took the opportunity to film some shots of the rain on the pan, which is always a bit of a logistical nightmare as the CAMERA MUST STAY DRY AT ALL COSTS. It doesn’t matter so much about the people! Afterwards Brad spent a solid 15 minutes terrifying the pants off the kids pretending to be the Zoogor from Tarzan.